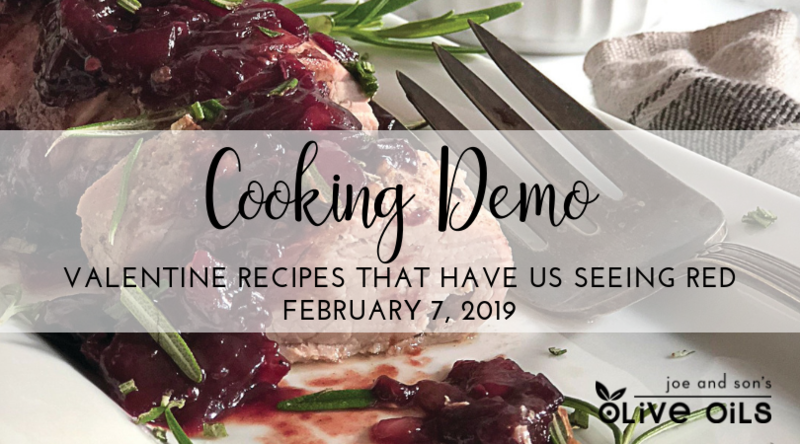 Join Joe and Son's Olive Oils at 3204 W. Bay to Bay Boulevard in Tampa on Thursday, February 7th, from 6:30 PM to 8:30 PM, for a cooking demonstration that will prepare you for Valentine’s Day! At Joe and Son’s, we love Valentine’s Day for all the usual reasons. It gives us an excuse to shower our loved ones with cards, candies, unusually rich dinners, and plenty of wine. Here’s one reason we’re not so hot on this cuddly holiday: all the food coloring. Red velvet cake, red velvet cupcakes, red velvet fudge, and all the other iterations of this “flavor” that has taken over Valentine’s Day are great when you’re a kid, but as an adult it’s hard to forget about what all those artificial food additives are doing to your health! In the interest of still being festive with our Valentine’s Day menu plans, we sought out some of the deepest, darkest, reddest dishes — no food coloring allowed. About the Classes: Tickets are $30. Each class teaches tasty techniques and food preparation along with providing a generous tasting of each dish prepared…so come hungry! We invite you to bring your own wine to enjoy with the food. We will provide glassware and expect alcohol to be consumed responsibly. Bonus: Each attendee will receive 15% off their Joe and Son's purchases the day of the class. Classes are subject to cancellation or rescheduling. All class sales are final.